Three linked cases will be heard by the Supreme Court this week from Monday to Thursday 24 – 27 January 2011: Al Rawi and others (Respondents) v The Security Service and others (Appellants); Home Office (Appellant) v Tariq (Respondent); and Home Office (Respondent) v Tariq (Appellant). A nine-strong bench will hear the cases, consisting of Lords Phillips, Hope and Rodger, Lady Hale and Lords Brown, Mance, Kerr, Clarke, and Dyson. The Al Rawi case arises from allegations of mistreatment of detainees in US-government run detention facilities and the issue is whether it is open to a court, in the absence of statutory authority, to order a closed material procedure for part (or conceivably, the whole) of the trial of a civil claim for damages in tort and breach of statutory duty and here are the case details for Al Rawi. The case of Tariq concerns the dismissal of an immigration officer of Pakistani origin who had received security clearance but later suspended on national security grounds following the arrest of his brother and cousin in connection with a plot to attack transatlantic flights on the basis that association with his relatives may put him at risk of their attempting to influence him to abuse his position. A race discrimination claim has been filed. 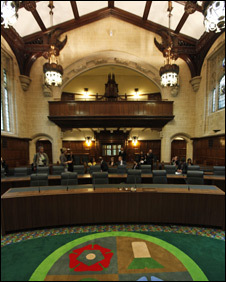 The issues to now be decided are: (1) whether the decision of the House of Lords in AF (No.3) – that the gist of the case against a person subject to closed proceedings must be disclosed to enable a fair hearing – applies to proceedings for race discrimination in the Employment Tribunal; and (2) (on a cross-appeal) whether the use of a closed material procedure in the Employment Tribunal meets a test of being necessary in the interests of national security; and whether the use of special advocates is inconsistent with the law on conflicts of interest in that they are instructed by the Treasury Solicitor. The Supreme Court case details are here for Tariq as the Appellant and here for Tariq as the Respondent. The Supreme Court has announced judgment will be handed down on Yemshaw v London Borough of Hounslow on Wednesday 26 January 2011. The case was heard 2 December 2010 and here are the Supreme Court case details. There are no cases being heard in the Privy Council and no judgments have been announced for hand-down this week. Documentary in which four Justices of the Supreme Court, the final court of appeal, talk frankly about the nature of their work and how they make decisions. The programme explores how fair the rulings of the court’s members – 11 men and one woman – are and whether their feelings ever influence their judgments. In its first 14 months, cases included MPs’ expenses which resulted in the prosecution of David Chaytor, amendments to the status of pre-nuptial agreements, and proceedings with the Government over control orders and the Human Rights Act. Narrated by Aidan Gillett. Part of the Justice – A Citizen’s Guide season. The programme will feature interviews with Lord Phillips, Lord Hope, Lady Hale and Lord Kerr. Leave a reply on "In the Supreme Court w/c 24 January 2011"